The old fire station is in the corner of the church grounds. Dating from the 19th century it’s now empty but at one time would have housed the village fire engine. Open fires were an ever-present danger and most people used candles or the occasional oil lamp for lighting. If you spot a serious fire today you dial 999 and call the fire service but it hasn’t always been the case. Just one year after the Great Fire of London in 1667 the first fire insurance company was formed. The early insurers soon realised they needed to protect their own interests so began to provide men and fire appliances to deal with outbreaks of fire. For over 100 years, insurance company fire brigades provided the main fire fighting force in Britain. Each insured building had a fire mark attached to the outside, a metal plate made out of lead or copper displaying the company’s trademark and the householder’s policy number. The disadvantage of this system was that if your house was not insured there was no guarantee that the brigade would attempt to put the fire out. Abraham Cunnington, Miller and Farmer (1792). In 1707 it was made obligatory on the churchwardens to take over the responsibility for fire protection. This local protection generally worked alongside the insurance company fire brigades. This arrangement lasted until the Local Government Act of 1894 when Parish Council’s took over responsibility for fire fighting. The earliest engines were hand powered and the water was supplied by men carrying buckets and dumping it into a container which fed the manual pump. In 1822 an engine was invented which could draft water from a water source. A new fire engine was purchased for the village in 1826. It was still in use 66 years later but must have been must have been showing its age. It was reported at the Greyhound fire of January 1892,“The local engine, an antiquated piece of mechanism, which had not been put in use for a long time, was found to be of little use, as is usually the case when wanted, in fact, quite incapable of saving the building”. In August 1908 the Peterborough Standard reported that the Parish Council of the time had been considering buying a new fire engine to replace the old one that had been in service for many years. The engine being they were looking to replace was the one purchased from Merryweather & Sons in 1826. The ledger or order for this engine was reported in one of the local papers at the time: “The Parish of Eye, Northamptonshire. By Order of the County Fire Office To M. Merryweather, 1826, Feb 23rd. 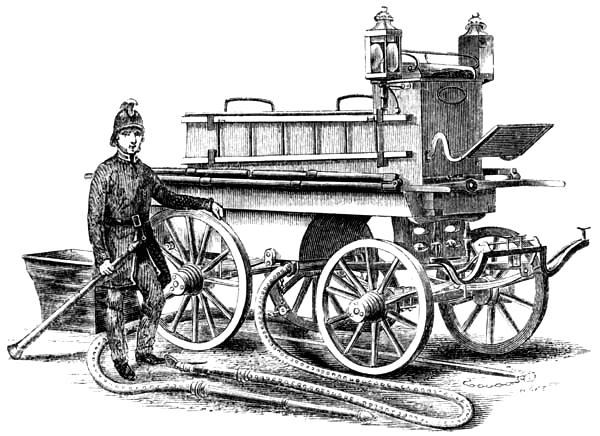 A new third size patent fire engine, mounted on strong spoke wheels with fore-locking carriage, fitted with metallic pistons and valves and finished in the best manner, painted green and vermilion, including a strong copper branch pipe with brass nose pipe £76 11s; one length of strong leather hose, 40ft with brass screws, and one ditto 30ft, with ditto £7 15s; writing on each side of the engine in yellow letters, shadowed, “The Parish of Eye. Daniel Swift and William Little, Churchwardens, 1826.” 12s 1d; packing ditto in case, carriage to the Ram Inn, Smithfield, booking etc., £2 16s. ; a double ended tall iron wrench 7s. 6d; total £88 5s.” In the end, it was decided to stay with the existing machine. To pump water one end of the hose would have been put in a nearby well or stream and the other end connected to the engine. Water would have passed through the manually operated pump and flowed out through the hose held by the fireman and onto the fire. You will find some old machines here. The need for parishes and insurance companies to provided fire fighting equipment ended with the 1938 Fire Brigade Act which placed responsibility for the provision of a fire brigade onto the local authority. 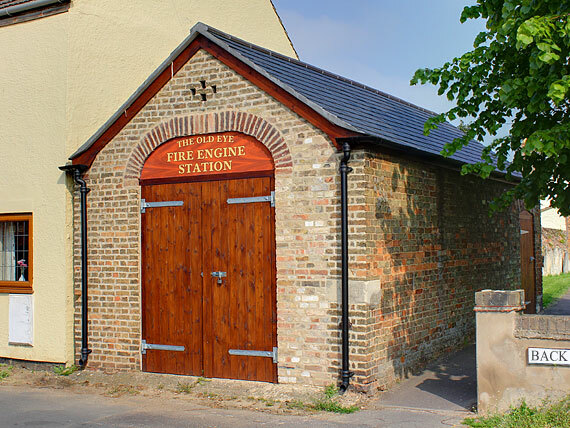 Eye Fire Station was brought back into use for one last time during the second world war. By 2011 the arch over the front door had begun to collapse and had become unsafe. In 2012 the Parish Council with assistance from St Matthew’s Church and Rural North Neighbourhood Committee restored the old building. New doors and roof were fitted, the arch was rebuilt and a new sign added above the door. The Parish Council won the Peterborough Development and Environment Award for the ‘best building conservation project’ for the restoration.